As computers started becoming more prevalent in workspaces and classrooms, doctors began to see an increase in cases of carpal tunnel syndrome. This particular medical issue develops in the wrist and is actually fairly similar to a problem that can arise in your ankle – tarsal tunnel syndrome. Tarsal tunnel syndrome might not be quite as prevalent as carpal tunnel syndrome, but your painful symptoms need to be addressed, and our doctors can handle this for you any of our Austin offices. Our FREE book on nerve pain might help you better understand the source of your pain, as well as offer helpful prevention and at-home treatment options. What Is Tarsal Tunnel Syndrome and Why Does It Happen? The best starting point for looking at this particular ailment is with a structure found on the inner edge of your ankle known as the tarsal tunnel. This is a narrow space covered by a thick ligament (the flexor retinaculum) which serves to protect the anatomical structures it contains – tendons, nerves, arteries, and veins. As it relates to this condition, an important nerve found within the “tunnel” is your posterior tibial nerve. The problem begins when there is a squeezing or compression on the posterior tibial nerve, and this is similar to the carpal tunnel syndrome that can occur in the wrist. In both cases, the root cause of pain and discomfort is compression on a nerve found in a confined space. Down in your tarsal tunnel, the source of that compression can come from any of several different possibilities, such as arthritic bone spurs, ganglion cysts, swollen tendons, and varicose veins. Some cases of tarsal tunnel syndrome develop in response to injury, particularly ones that cause swelling or inflammation in or near your tarsal tunnel. In other instances, a systemic disease (like arthritis or diabetes) causes the swelling. Additionally, individuals who have flat feet also have higher risk, which can be attributed to an outward tilting of the heel as a result of the structural abnormality. You can learn more about nerve pain with our FREE book offer! What Are Treatment Options for Tarsal Tunnel Syndrome? Immobilization. One of the best ways to allow the nerve and surrounding tissue to heal is by restricting the movement of the foot. This can be achieved with the use of a cast or brace. Medication. You can reduce inflammation and pain with the use of nonsteroidal anti-inflammatory drugs (NSAIDs) and our doctors can provide you with appropriate dosage recommendations. 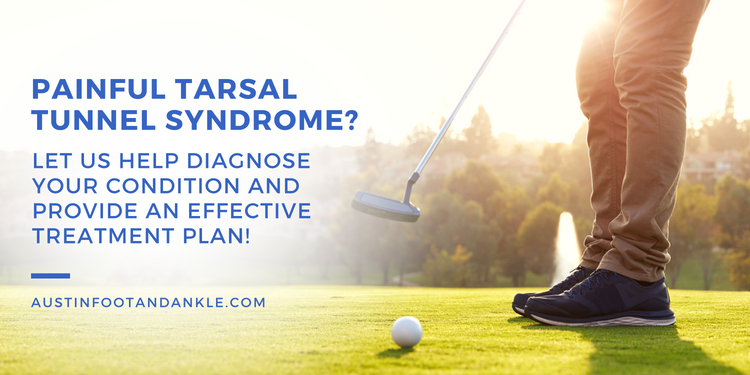 Tarsal tunnel syndrome is just one of the various ailments that might be the source of your ankle pain, but our expert team at Austin Foot and Ankle Specialists can help by diagnosing your condition and then providing an effective treatment plan. We provide first-class podiatric services for patients from all across the greater Austin community, so come in and see for yourself exactly why they consistently choose us for their foot and ankle care. You can contact our practice by calling (512) 328-8900 and speaking with one of our friendly staff members. We are happy to provide additional information, answer any questions you might have, and help set up your appointment. If you’d prefer, you can always request an appointment with any of our offices online.